Aerial for HF, is an 8 band vertical DX88 by Hygain (Also fitted top Band Coil if Top Band operation is required. This is ground mounted with lots of ground radials. Approx 25 feet from the back of the house on a postage stamp garden. The company car is now a Renault Laguna 11 Plate but still has some EMC issues as I had with the Honda Insight Hybrid. 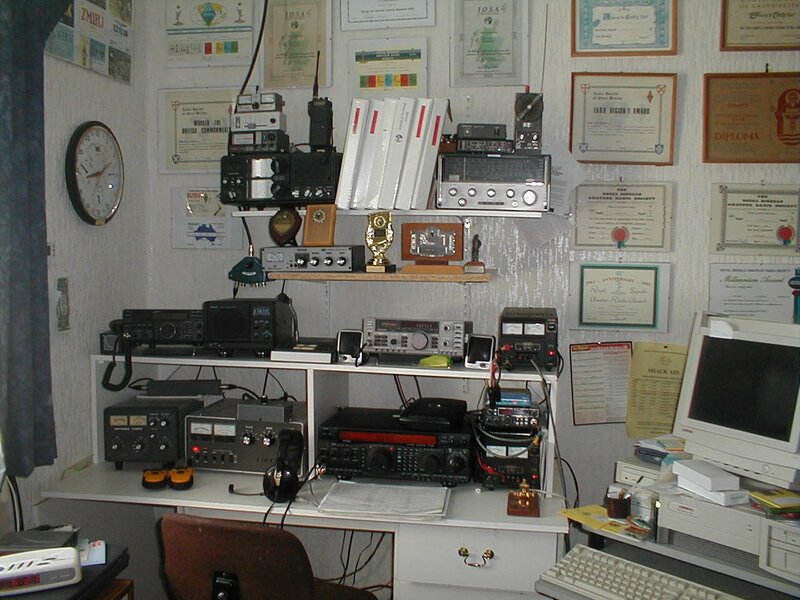 The GM4EMX Shack (1999) with the Old FT101ZD's Now Gone. On the 6th May 1999 the first Scottish Parliament in 300 years was voted in by the people of Scotland. To honour this event special prefixes where issued from the 6th May 1999 to the 31st July 1999. Therefore GM4EMX became 2S4EMX. GMDX group believed that Amateur Radio should play its part. As such, GMDX with and Ofcom agreed to special prefixes being used by Radio Amateurs in Scotland until 30 November 2009. The prefixes will be GA, MA and 2A. The A, replacing M in the prefix, signifies Alba the Gaelic name for Scotland.